evaluator | Virtual Assistant Inc.
Development in web technologies is rapidly emerging from one after the other and though this development revolutionizes and simplifies the ways and means of how we use and design the web, these changes are somewhat an added burden to some companies. Sometimes, few companies find it hard to point out the important factors that compose a successful website. With regards to the existing needs of these companies, Bartlett Communications launched a free online website evaluation tool called eValuator. 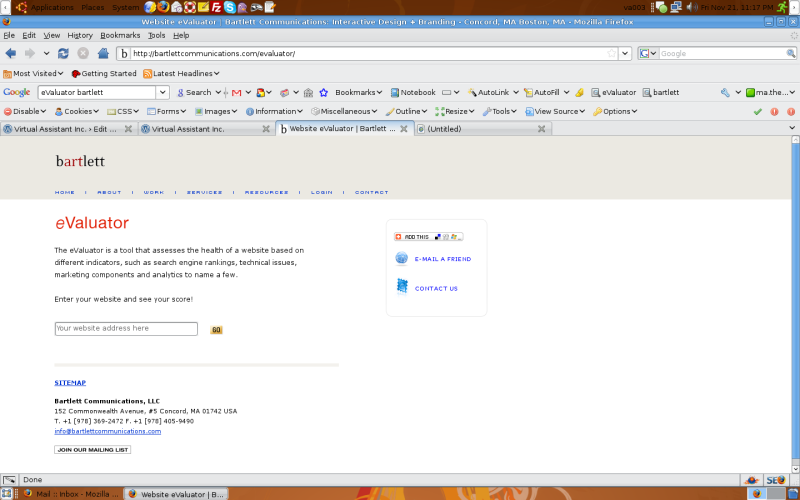 Evaluator provides companies an evaluation tool on their website health and value by simply entering their website url. After the software evaluated the specified website, the tool will provide information on its functionality and wellness and it will also indicate ways of improving the web site’s performance. 2. These indicators are weighed individually according to its level of significance. 3. After assessing the website according to the criteria, a detailed description of such criteria is presented and the suggested ways to improve the website performance. In using this tool, marketing heads of small to medium businesses can create a more vivid strategy and better understanding on how to increase traffic on their website and most importantly to increase business sales. Check out www.bartlettcommunications.com for more information.